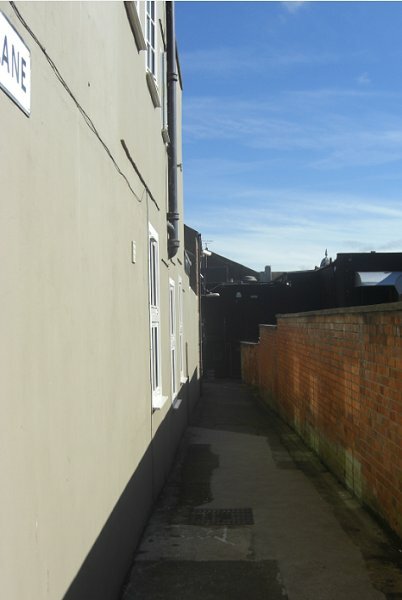 Earlier called Narrow Lane, in the mid-nineteenth century today's Tabernacle Lane was called Hannam’s Lane because Josiah Hannam, a senior member of the Society of Friends, had an ironmongery warehouse and a yard there. 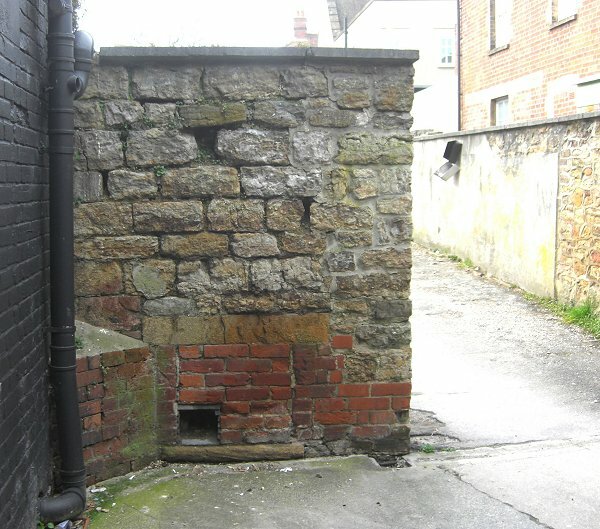 However Tabernacle Lane has been most often used since the founding of the Calvinist Tabernacle Meeting House in 1804. In 1794 John Wainwright Morren became minister of the Congregationalist Church in Princes Street, resigning in 1804 after a doctrinal dispute which led to what the Church Record Book calls 'The Separation'. Led by John Hookins and his wife Elizabeth, a separatist group of the Congregationalists built a new meeting house in Narrow Lane. In 1833 a plot of land 81 feet x 44 feet (24.7m x 13.4m) in Huish for a burial ground. The burial ground gave the name Paradise to this end of Huish. By 1886 the burial ground was disused. The site was later cleared and now lies under the magazines section to the south of the main entrance in the Tesco store in Huish. In the 1850s Daniel Vickery wrote "The Tabernacle is situated in Hannam's-lane, and is a small, but very neat and commodious, place of worship. It was founded 50 years ago. The congregation has a burial-ground, in Huish, about 23 perches in extent. The present pastor is the Rev. J. Comfort". The Tabernacle had a flourishing congregation and the Ecclesiastic census of 1851 recorded regular congregations of between 150 and 200. Indeed the caption on the map below reads "Tabernacle (Calvinist Methodist) Seats for 400". However the congregation gradually dwindled and by the early twentieth century was quite small. Services finally ceased in 1920 and the Tabernacle building itself was demolished in 1971. 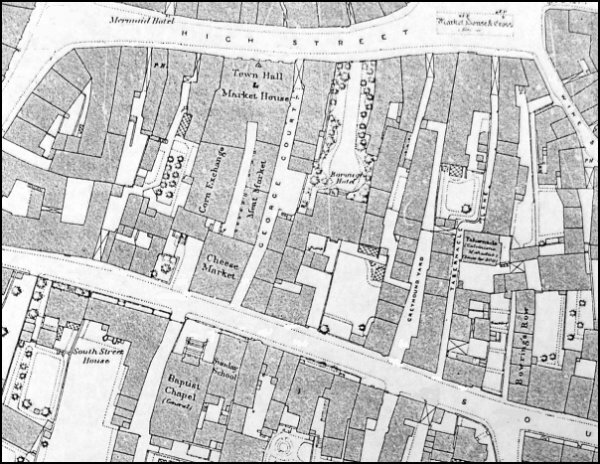 The 1886 Ordnance Survey showing High Street running across the top of the map and South Street at the bottom. Tabernacle Lane is at centre right running between the two while the Tabernacle itself is at the centre of Tabernacle Lane.. This map is based on the 1886 Ordnance Survey above, but rotated 90° with the Borough at extreme left and South Street at extreme right. 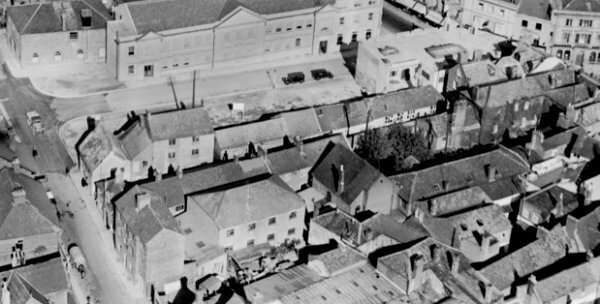 This photograph was taken around 1960, before the demolition of the buildings on the right. 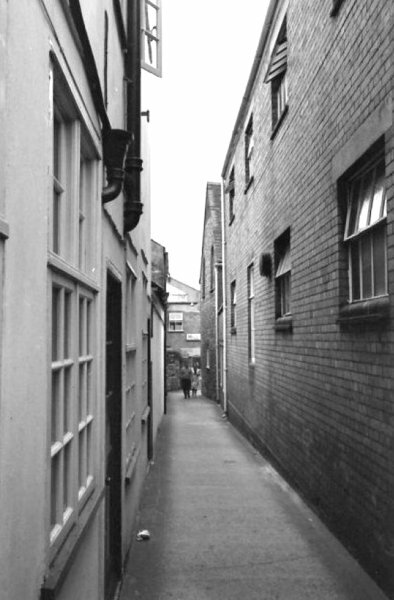 The gabled building at the end on the right by the two people is the tabernacle that gave this alley its name. Almost the same view in 2013. Approaching the dog-leg from High Street, this corner is about all that remains of the tabernacle. Photographed in 2013. 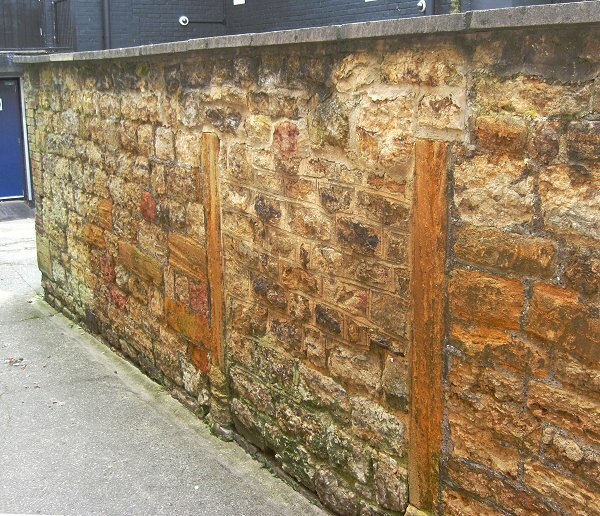 The wall by the dog-leg, these are the Ham stone door jambs of the original tabernacle. Photographed in 2013.